Are your sales down this quarter? Has your classic "What will it take to earn your business?" pitch been getting shot down left and right? Want to know how to fix it? Two words. New hairstyle. That's what you need. Easy solution. It just so happens that this blonde wig gives you just the panache you need to make the sale. Yeah, step right up. Whatever you're peddling when you've got a head full of blond hair, you'll be out of inventory in no time! This wig will make it a breeze to sell ice to Inuits. Your locks will make you capable of selling a cage to a lion. You'll roll in the bucks by selling dirt at a worm convention. 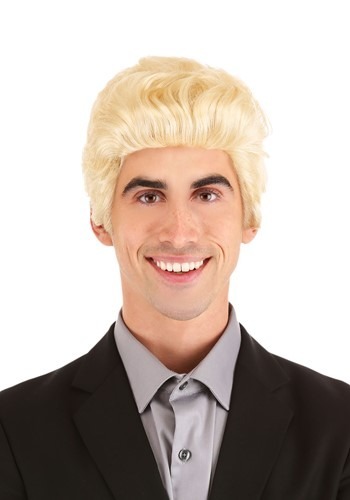 Hey, if you show up in person with your golden head of hair, you could probably even sell us a few Halloween Costumes, you're just that convincing. So, what can we do to put you in this wig today?